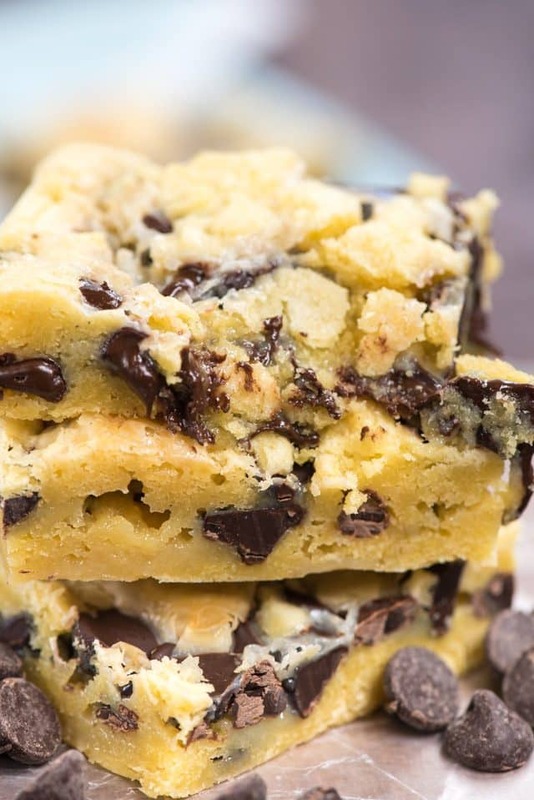 Chocolate Chip Gooey Cake Bars are a fun twist on an old favorite gooey bar! Cake mix baked with gooey chocolate chips! EVERYONE loves these! I am a bit of a gooey bar aficionado – you can see that I have a ton of gooey bar recipes. These are so good and full of chocolate! Last week my daughter told me she volunteered me to make gooey bars for her art class party. She wasn’t going to be at the party, but no worries, I could simply make the bars and she’d take them in a day early. Luckily, gooey bars are in my wheelhouse in a big way. Plus, ooey gooey bars like this are super easy to make and just have a few ingredients that you already have in your kitchen, most likely. She asked for sprinkle gooey bars but I was all, um honey? I already have gooey bars with sprinkles. Then she told me to add chocolate chips and I wavered a bit, because one of my most popular gooey bar recipes uses a chocolate chip cookie base, but I realized that making an easy gooey bar with chocolate chips was actually a perfect recipe to post. 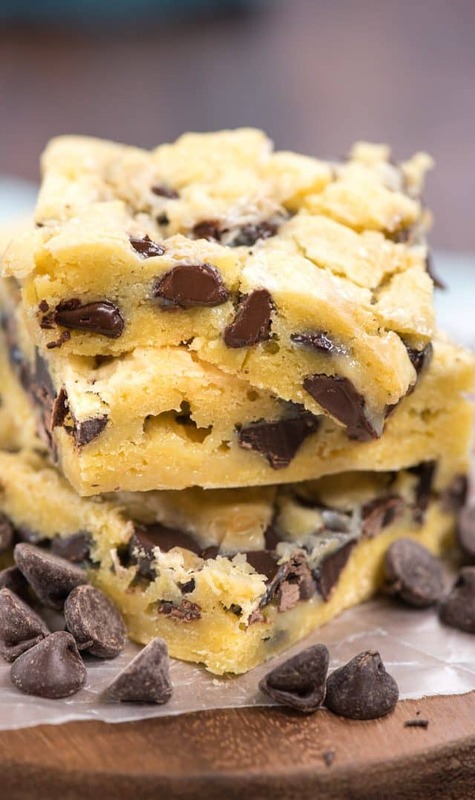 These chocolate chip gooey cake bars are easy and fast to make and they have just a few ingredients. And look how gooey they are! These are actually so gooey that you have to chill them before you slice them. Once that happens, they’re fine but it takes them a long time to set. That means they’re extra gooey cake bars! If you don’t have the patience to wait for these to cool, I’ll suggest eating them with a fork straight from the pan. I couldn’t do that with these because I was sending them to school with Jordan…but if it wasn’t for that I would have. How do you make gooey cake bars? This bar cookie recipe is easy because it starts with a cake mix. I used a basic yellow cake mix (you can use any brand) but you could also use a white cake mix or any flavor you want. I’ve also made these with chocolate cake mix, brownies, red velvet, and lemon cake mix. Your cake mix only needs two extra ingredients to become a cookie-like texture: butter and an egg. 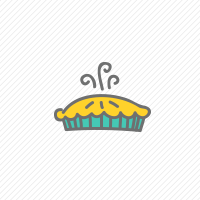 Make sure to use softened butter for best results. The mixture is very thick. If you’re using a stand mixer it’ll come together fairly quickly; a hand mixer will take more time. Doing it by hand is doable but will take good arm strength and a long time, so beware. Once the base is done you gather the gooey part of the cake bars: the sweetened condensed milk. Sweetened condensed milk is condensed milk where 60% of the water has been removed and sugar is added. It’s cooked to a thick and gooey state before being canned. Beware: condensed or sweetened condensed milk is NOT evaporated milk. Do not substitute one for the other. To assemble the gooey bars, you press two-thirds of the batter into a pan to make a thin layer. You top it with the sweetened condensed milk and toppings, in this case chocolate chips, and then you drop the remaining batter on top. 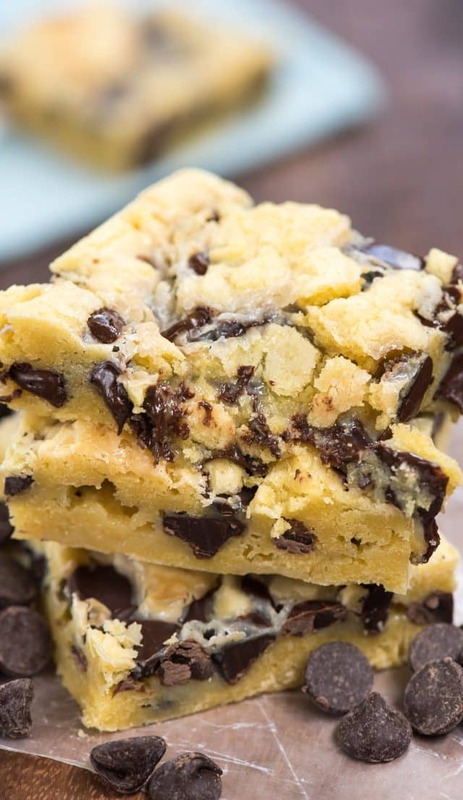 Chocolate Chip Gooey Cake Bars are an easy cookie bar recipe perfect for any occasion! Let’s talk about pan size. Most of my gooey bar recipes are made in a 9×9-inch square pan. Those use a half a can of sweetened condensed milk and are super thick. Because I needed a class-amount of these bars, I made them in a 9×13-inch pan. I’m always getting asked if I can double my gooey bar recipes, so I wanted to show that you don’t have to double all the ingredients to get a 9×13-inch pan size. The recipes are mostly interchangeable except for the amount of sweetened condensed milk used. Because the pan is larger than my normal recipes, if you’re used to my normal gooey bars, the amount of batter on top will be sparse. The milk and chocolate chips will show through. The cookie bar will cook together to cover most of it, but it’s not a solid layer on top. Once these are baked, you must cool them to room temperature and then chill them until they’re set before you can cleanly slice them. They will be messy and sticky if you try to slice them before you chill them, so beware. This recipe is always one that gets rave reviews. People love cake mix gooey bars, especially with chocolate. Don’t forget the chilling step! Preheat oven to 350°F. Line a 9x13-inch pan with foil and spray well with nonstick cooking spray. Press 2/3 of the batter in the bottom of the prepared pan. It will be a thin layer. Top with the can of sweetened condensed milk, leaving a 1-inch border around the edges. If it's touching the foil it has more chances of bubbling up and/or sticking. Sprinkle chocolate chips over sweetened condensed milk. Press tablespoon sized balls of the remaining dough between your hands and place on top the chocolate chips. It won't be a solid cover. Try to make the edges as solid as possible. Bake for 20-30 minutes, or until golden brown and milk is bubbling up. Cool completely, then chill until set so you can remove the foil and slice. These won't slice nicely until they are completely chilled. Be sure to check out all my gooey bar recipes! And I cannot wait to try Gooey Blueberry Cookie Bars, Lori’s Gooey Salted Caramel Chocolate Chip Cookie Bars, or Jocelyn’s Fudge Mint Gooey Brownie Bars! 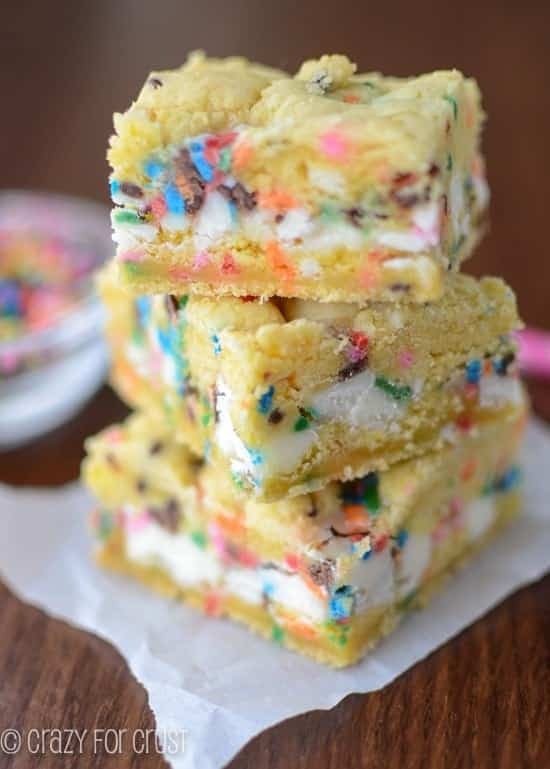 Funfetti Gooey Bars are the OG of my gooey bar recipes! 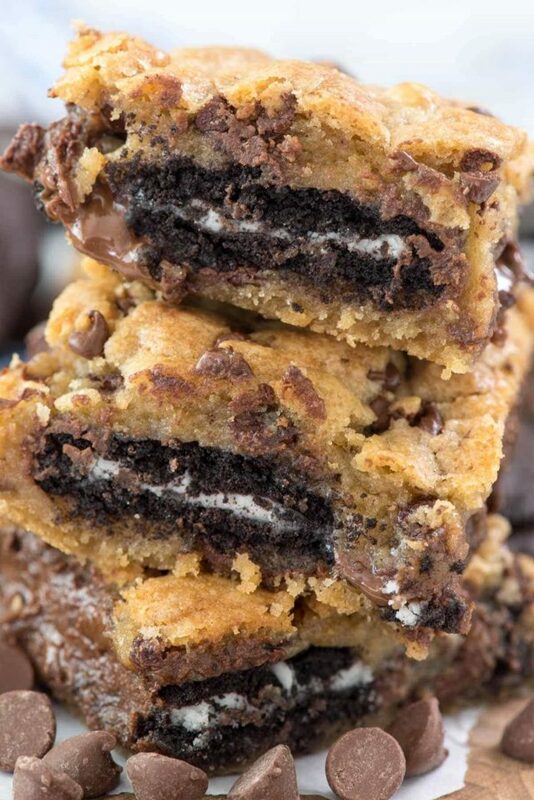 Oreo Chocolate Chip Gooey Bars are stuffed with Oreos! 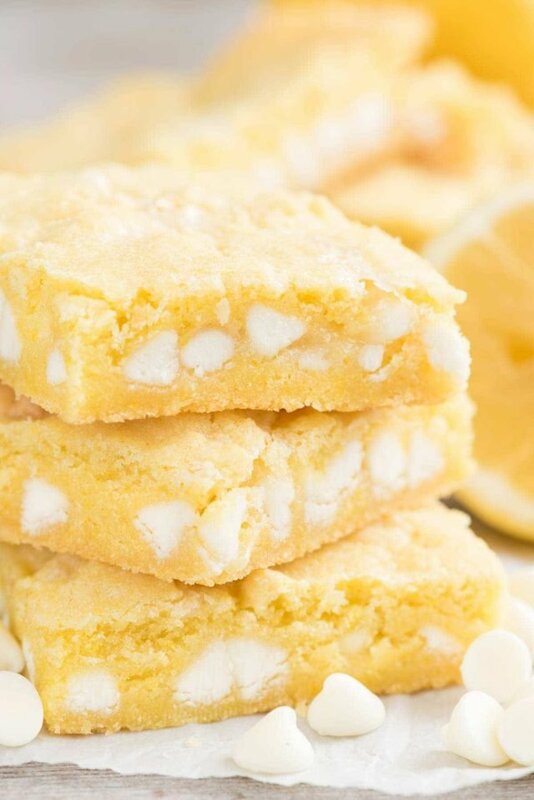 Lemon Gooey Bars start with a lemon cake mix! These look incredible and I have made your gooey bar recipes before…so good. I also just realized I ate a dessert at your house when you hosted the big blogger group, and I can’t remember what it was, but it was so good I wanted to hoard it all. I even made it at home in San Diego…if only I can remember. Getting old lol. Extra gooey gooey bars AND they have choc chips?? Obviously I’m all about it! The video shows choc chips being added to the batter. The directions don’t say to do this. Which is correct? I think add 1 cup as in video then add 1 cup chips after condensed milk, top with last dough. I’m making for Xmas 2018 I’ll do like video.